Green roofs are internationally placed in two different ‘types’: Of course there is some cross over between the categories. The planning, implementation and maintenance of all these types is covered in the UK Green Roof Code of Practice. known as the GRO code. 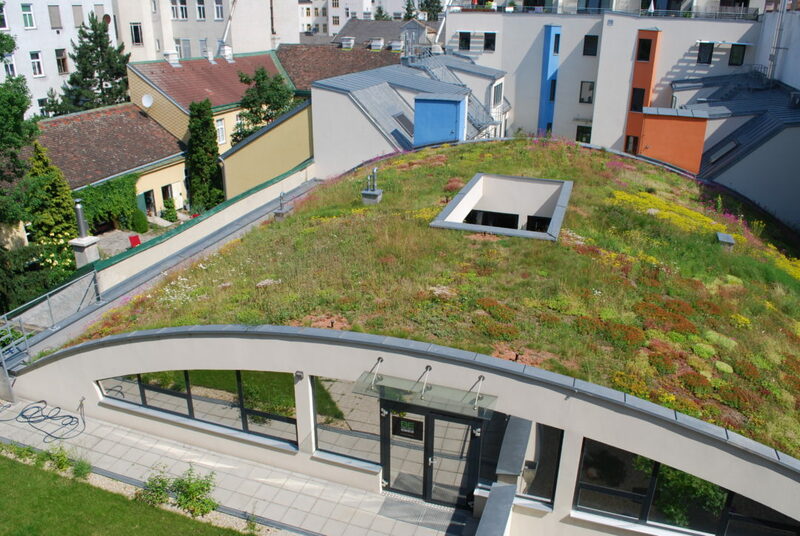 All green roof codes of practice globally are based on the German FLL. In the recent past, which Livingroofs.org was partly responsible for, brown roofs was a widely used term. Although some people still refer to old style brown roofs, they should be considered as extensive biodiverse roofs. They should also be designed and considered as ecological landscapes and not as a product. A summary of the general characteristics of each category can be seen below. Although there is some cross over, the maintenance, costs and structural requirements do differ. Furthermore we have provided an overview of the broad benefits to the environment of each. Green roofs can provide important refuges for wildlife in urban areas. Research in Switzerland and the UK has demonstrated that green roofs can provide important refuges for rare invertebrate populations. Green roofs can significantly reduce the surface run off volumes and rates of rainfall leaving roofs. As a source control mechanism in the Sustainable Urban Drainage System green roofs can help reduce flash floods as a consequence of intense rainfall events. This will become increasingly important as a consequence of climate change. Green roofs also improve the quality of water and although the amount of water is reduced it is possible to rainfall harvest from roofs that have been greened. Green roofs cannot be given a U-value at present. However they have been shown to significantly reduce the need for air conditioning in summer and can provide a degree of insulation in winter. 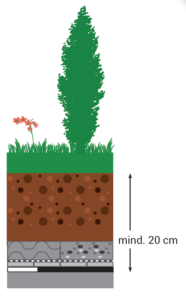 The combination of soil, plants and trapped layers of air within green roof systems can act as a sound insulation barrier. Sound waves are absorbed, reflected or deflected. The growing medium tends to block lower sound frequencies whilst the plants block higher frequencies. 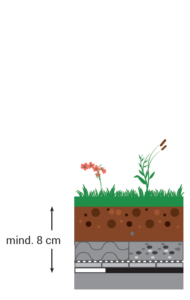 The original green roofs in Germany stem from covering wet bitumen with 6cm of sand, which became vegetated. This covering was to protect the wet bitumen from fire. Green roofs have now been shown to double if not triple the life of waterproofing membranes beneath the green roof. Airborne particles and pollutants are filtered from the atmosphere by the substrates and vegetation on a green roof. Urban Rooftop Food Growing – roofs strong enough to provide a space for urban food growing. Although many large flat roofs may not have the loading capabilities to hold food growing, some roofs will and the many balconies in urban areas are ideal.